Anjaan, the Suriya starrer, Lingusamy directorial is all set to meet its date with the audience on this Independence Day, August 15th. The film is a much-awaited one and stars Samantha as Suriya’s onscreen partner along with Vidyut Jammwal, Soori and others. Yuvan Shankar’s music is rocking the charts with Suriya crooning the number 'Ek Do Theen' for the first time. The trailer of the film was released recently and within three days it has crossed one million views in the online world. The unit is quite ecstatic about this and for the audience the exciting release countdown has begun! 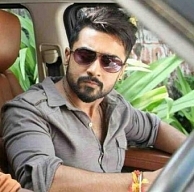 Suriya's Anjaan Having A Record Advance Booking ! People looking for online information on Anjaan, Anjaan trailer crosses one million, Lingusamy, Suriya will find this news story useful.